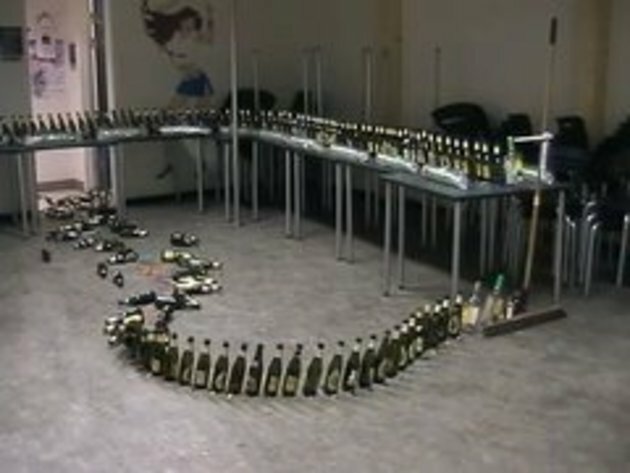 A dominoes set / Rube Goldberg machine made with hundreds of beer bottles! Why is the guy sitting on the toilet with his pants down but is underwear still on? It was too weird for me. Absolute genius. I didn’t expect it to go on that long, a lot of thought (possibly too much) has gone into that. Anybody else see the guy at about 16 seconds just give them a bit of a nudge with his toe. Wow... this was as much fun as watching a log rot. Totally pointless, until the end. Nice work guys. hahahahaha det er i den grad dansk!!!! I'd rather do it with something less breakable, what a mess to clean up!! Got to admit, that was funny! Expected it to stop a couple of times, then Pow! Another row starts tumbling dowm. Lots of work setting that up, but next time, start in a different room! very awesome... thats one way to drink a beer!